Even today, linear quantum optics—the physics of how single photons behave in mirrors, waveplates, and beamsplitters—leads the way in terms of observations of multi-party entanglement, tests of quantum nonlocality, and addressing fundamental questions about the nature of reality itself. Light notoriously avoids interaction. One beam of light does not readily affect anything about a second beam—they simply add up, through interference, and go about their business. To date, quantum mechanical tests have relied on our ability to produce states of light in which, when all the photons are measured, a subset of the measurement patterns can be sifted out—those in which a desired interaction has occurred. Physicists call this technique 'postselection'. New work by a team at the University of Bristol's Centre for Quantum Photonics has uncovered fundamental limits on the quantum operations which can be carried out with postselection. As physicists build bigger and bigger quantum states of light, fewer and fewer entangled states are reachable using postselection alone. The Bristol team found that as the complexity of the postselection scheme increases, the desired interacting state, which at first is easy to sift from the larger state, starts to behave indistinguishably from the noise, making postselection impossible. Each photon can carry a quantum bit, or 'qubit', of quantum information, for applications ranging from quantum computing to quantum communications. 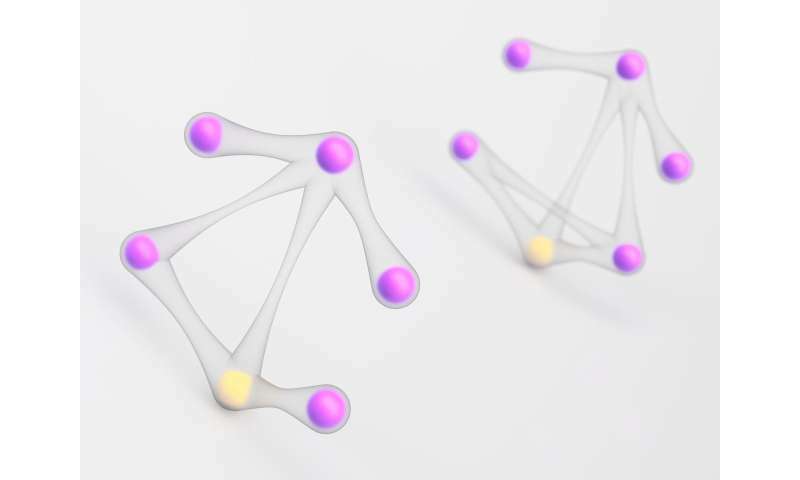 An important class of entangled states are the 'graph states', so called because their entanglement can be visualised as connections between the qubit nodes of a graph. Applying their postselectability heuristics to graph states, the researchers catalogued which graphs of up to nine qubits are postselectable, finding these to be fewer than one fifth of the total. This fraction is expected to drop severely for larger quantum systems, limiting the kinds of entanglement that can be reached with today's quantum photonic technology, and strengthening the call for new technologies to generate and entangle photons. The work is published today in the journal Quantum Science and Technology. Jeremy Adcock, lead author of the new work, said: "Even though our rules for postselection show that most states are off limits, they also tell us how to build experiments of maximum complexity." Dr. Joshua Silverstone, who led the project, and is a Leverhulme Early Career Fellow at Bristol, added: "People have known about problems with postselection for many years, but it's remarkable that only now can we see through to its fundamental limits." "Postselection still has some fight left in it, but this work should really make people think about modern approaches to optical quantum tech." More information: 'Hard limits on the postselectability of optical graph states' by J. C. Adcock, S. Morley-Short, J. W. Silverstone, and M. G. Thompson in Quantum Science and Technology, Quantum Science and Technology, 2018.